Described as the first major U.S. female political figure since Eleanor Roosevelt (1884–1962), Hillary Rodham Clinton has become a strong force in American politics. As first lady, married to Bill Clinton (1946–), the forty-second president of the United States, she became active in domestic policy. Her election as a U.S. senator from New York in 2000 marked the first time that a first lady still in the White House was elected to office. Hillary Diane Rodham Clinton was born on October 26, 1947, in Chicago, Illinois, and grew up, along with two younger brothers, in suburban Chicago. Her parents, Hugh and Dorothy Howell Rodham, raised their children with traditional middle-American values that stressed family, church, school, and social obligations. As a youth, Clinton was influenced by her religious education, especially from the Reverend Don Jones, who introduced Rodham to some of the issues, causes, and movements of the time. It was under Jones's guidance that she read religious philosophers and helped the needy by babysitting the children of migrant farm workers. Another influence was meeting the Reverend Dr. Martin Luther King Jr. (1929–68) during his trip to Chicago on a speaking tour. In 1965 Clinton enrolled in Wellesley College in Massachusetts, where she majored in political science and minored in psychology. Her undergraduate studies inspired her developing world view. A natural communicator, she motivated many of the movements for change occurring on the Wellesley campus. Graduating with highest honors in 1969, Clinton gave the first student address delivered during graduation ceremonies in the history of the college. In the fall she enrolled in Yale University Law School. Clinton's experiences at Yale helped to focus her areas of interest and commitment toward issues related to children, especially the poor and disadvantaged. For a summer, Clinton worked with Marian Wright Edelman (1939–), a civil rights attorney who headed the Washington Research Project, a nonprofit group based in Washington, D.C. The group would later become known as the Children's Defense Fund. Afterwards, Clinton returned to Yale, where she volunteered in several projects aimed at improving the legal system to address children's rights. After graduating in 1973, Clinton moved to Washington and took a full-time position with the Children's Defense Fund as a staff lawyer. In January 1974, she was chosen as one of forty-three lawyers handpicked to work on the legal staff of the House Judiciary Committee. Democratic opponents of Republican president Richard Nixon (1913–1994) during the 1972 presidential campaign. Eventually the American public would learn of Nixon's involvement in the scandal. The president's involvement all but forced him to step down from office. After Nixon left office on August 9, 1974, the legal staff broke up. Soon Clinton accepted a teaching position at the University of Arkansas Law School. It was in Arkansas in 1975 that she married Bill Clinton, whom she had met while attending Yale. Two years after their marriage, Bill Clinton became attorney general of Arkansas, and the couple moved to the state's capitol, Little Rock. In 1977 Hillary Clinton joined the Rose Law Firm, said to be one of the oldest law firms west of the Mississippi River. Her primary focus, however, remained in the area of children's rights, and she helped found Arkansas Advocates for Children and Families. In January 1978, following her husband's successful bid for governor, Clinton became Arkansas's first lady. In February 1980, she gave birth to a daughter, Chelsea Victoria. 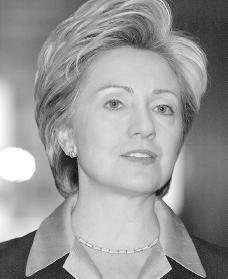 In her eleven years as first lady of Arkansas, Clinton continued to pursue activities aimed at public service and policy reforms in the state. In her husband's second term she served as chair of the Arkansas Education Standards Committee. In 1985 Hillary Clinton led the establishment of the Home Instruction Program for Pre-School Youngsters (HIPPY). The program brought instruction and tutorials into impoverished, or lower-income, homes, and became one of the largest programs of its kind in the country. In 1987 she was elected chairperson of the board of the Children's Defense Fund and of the New World Foundation, a charity organization headquartered in New York that had helped launch the Children's Defense Fund. Also in that year, Hillary and Bill Clinton were awarded the National Humanitarian Award by the National Conference of Christians and Jews. For the first time, Hillary Clinton enjoyed national attention when the National Law Journal, in 1988 and again in 1991, named her as one of the "One Hundred Most Influential Lawyers in America." After Bill Clinton was elected president of the United States in 1992, Hillary's involvement in political issues, both in the United States and in foreign countries, increased. She began to remold the role of the first lady. Hillary Clinton remained an advocate for many of the programs and issues to which she earlier devoted her time and professional skills. She provided leadership in a number of areas, including the Task Force on National Health Care, which was responsible for proposals and passing reform packages before Congress. Her White House agenda went beyond health care reform and included pushing for children's and women's issues. Hillary Clinton proved to be an active and vital figure in the White House throughout her husband's presidency. In August of 1995, Hillary Clinton was invited to deliver the keynote address (a speech that covers the issues that are most important to a particular group of people) at the United Nations International Conference on Women near Beijing, China. In November 1996, Bill Clinton was reelected president of the United States. In that same year Hillary Clinton published her first book entitled It Takes a Village: And Other Lessons Children Teach Us. The book became a best-seller. On September 20, 2000, Independent Counsel Robert Ray announced his final report reviewing the Clinton's 1970s-era Whitewater real estate partnership. Although the first family's involvement in the partnership was somewhat unclear, "Whitewater," as it would become known, was a real estate scandal that followed the Clintons throughout the 1990s. Ray said in his final report reviewing the scandal that there was not enough evidence to prove that either President Clinton or Hillary Rodham Clinton had been guilty of any criminal wrongdoing. In 2000 Hillary Clinton announced that she was running for a seat in the U.S. Senate from New York and was later named as the Democratic nominee. Her Republican opponent was originally Rudolph Giuliani (1944–), the mayor of New York. However, when Giuliani had to drop out of the race after becoming ill, Republican Rick Lazio (1958–) jumped into the race. On November 7, 2000, Clinton won the election. On September 11, 2001, terrorists attacked the United States and destroyed the World Trade Center towers in Manhattan, New York. Clinton then focused her energy on developing a plan to help that section of the city to rebuild. As a senator, Clinton also continues to work for laws to help children, women, and families. King, Norman. Hillary: Her True Story. New York: Carol Publishing Group, 1993. Milton, Joyce. The First Partner—Hillary Rodham Clinton. New York: William Morrow, 1999. O'Brien, Patricia. "The First Lady with a Career." Working Woman (August 1992). Sheehy, Gail. Hillary's Choice. New York: Random House, 1999. Warner, Judith. Hillary Clinton: The Inside Story. New York: Signet, 1993. Wheeler, Jill C. Hillary Rodham Clinton. Edina, MN: ABDO Pub. Co., 2002.